Articles about removing ransomware that blocks Windows or browsers and can encrypt your data and demand ransom. .zzzzz is actually redesigned Locky crypto-virus. We remind that Locky (and its new version) uses asymmetric encryption algorithm to encrypt user files, images, videos, documents, game files. Now virus can detect and encode more than 450 types of files. After encryption virus appends .zzzzz extension and modifies filenames sol they get long alphanumeric 24 digit names. This ransomware still extorts ransom of 3 BitCoins (~$2200) from user to decrypt files. Zzzzz ansomware creates 3 files on users PC: INSTRUCTION.bmp, -INSTRUCTION.html and _6-INSTRUCTION.html. All this files are used to inform users, that their system is hacked and files are encrypted. malware adds .aesir suffix and modifies filenames. Aesir ransomware demands user to pay ransom of 3 BitCoins (~$2200) to decrypt files, but never send the keys. Ransomware creates 3 files on users computers: INSTRUCTION.bmp, -INSTRUCTION.html and _1-INSTRUCTION.html. This files contain instructions for users to pay the ransom and get decryptor. Image is used to set as background and also contains ransom-note with payment details. 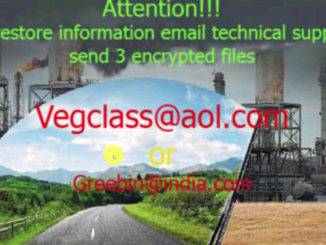 Vegclass is a ransomware that is very similar to Mahasaraswati, JohnyCryptor, Ecovector and JohnyCryptor. Once Vegclass has infected your computer, it encrypts various data. After finishing encrypting process, this ransomware adds .Vegclass(@)aol.com.xtbl extension to the name of all the encrypted files. It will create text file named “How to decrypt your files” in each folder with the encrypted data. Also this ransomware changes wallpaper on your desktop. Every change Vegclass makes on your PC is stating developer’s demands. These cyber criminals want you to contact them, then they will offer you to restore encrypted files by paying them a certain fee. It’s a browser hijacker that is usually accompanied with other free software. 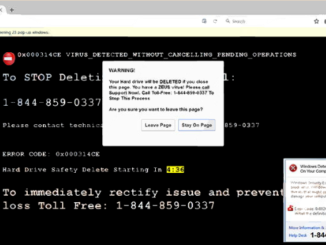 This malware shows the Windows Detected ZEUS Virus to trick the user. It’s created to make people think that their computer has crashed or that there is a real virus has been detected. The main purpose of such malware is to scare user and force him to call on one of the listed numbers to get support. But in reality they are just selling unneeded services and support contracts. When you see the black screen with the message that your files was encrypted with “HappyLocker” it means that your system infected by ransomware. The HappyLocker Ransomware is a threat that is designed to encrypt the victim’s data and demand payment in Bitcoins to release a decryptor. Payment amount is 0.1 BitCoin or approximately 70$. HappyLocker encrypts the files with AES-256 cipher or similar. The authors of the HappyLocker Ransomware deliver the Trojan to users by using spam emails. Users get it when they are opening emails with infected attachments.